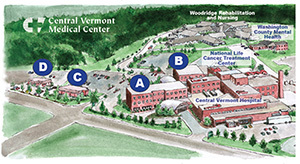 The goal of the UVM Health Network - CVMC blog is to support the health and wellness of our community. We hope you will find helpful information on good nutrition, physical activity, healthy lifestyle choices and more. Check back often for new content and subscribe to our eNewsletter. Take your unwanted or expired drugs in to National Prescription Drug Take-Back Day on Saturday, April 27, 2019 from 10 a.m. to 2 p.m. Drop off sites are available around central Vermont. Find a site near you. This April, we want to remind everyone that they can help save a life. Registering your decision to be an organ, eye and tissue donor takes less than a minute and gives hope to those waiting. CVMC physical therapist Hannah Zajac helps you to understand how concussions can cause imbalances in your brain by impacting its ability to maintain its internal conditions and processes. CVMC cardiologist Preeth Sundaran, MD provides diet and lifestyle tips that can help improve your heart health and lower your risk of cardiovascular disease. Preventing heart disease means making smart choices now that will pay off for the rest of your life. Anyone, no matter your age, can take simple steps to keep their heart healthy during each decade of life. More than 120,000 men, women and children in the U.S. — 5,000 in New England — are waiting for life-saving transplants. Find out how you can make a difference in the life of others by registering as a donor. The most common misconception about women and heart disease is that women are at less risk for heart disease than men. The reality is that heart disease is the leading cause of death for American women. Learn about your risk factors and how to live a more heart healthy life. CVMC physical therapist Kat Dwyer, PT, DPT, reveals how strengthening some lesser known core muscles might just serve as the magic ticket to staying healthy this winter season. Whether you are heading out to ski, ice fish, or just walk in the woods, follow these tips from CVMC Emergency Medicine Physician J. Brooks Motley, MD on preparations that can help you stay safe if you get stuck in the cold. This holiday season, and all year long, knowing how to choose appropriate toys can help keep your kids safe from toy-related injuries.